Subject/s: A. richly costumed bearded man, holding a suppliant's bough and standing in a sanctuary of Apollo, indicated by a statue of the god on an Ionic column set on a base and another column on the right supporting a tripod, is attended by four children who grasp his clothes. A fifth, older, stands behind and points to the herald on the left. Athena, on the right, looks on, indicating the sanctuary is in Attica. 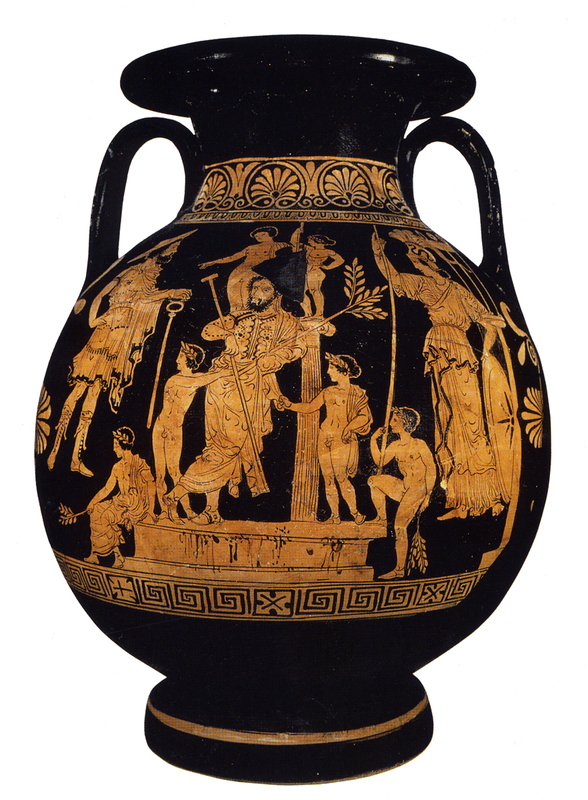 Analysis: found at Policoro, ancient Greek Herakleia, the vase was probably made there and is one of the earliest examples of the South Italian Lucanian. The costume of the principal figure, the setting and attention to detail confirm that this is a scene from Euripides' Herakleidae, which was probably performed in Herakleia.